Founder and CEO Rich Barton said in a radio interview on April 1st that he sees Zillow Offers as an evolution of Zestimates. In fact, at some point in the future, a Zestimate and a cash offer may be the same thing, he said in an appearance on National Public Radio. Glenn Kelman, CEO of Redfin, a real-estate brokerage that has also got into the home-flipping business, said he still believes the endgame for Opendoor, as well as his own company, is to get buyers to purchase homes without necessarily using an agent. 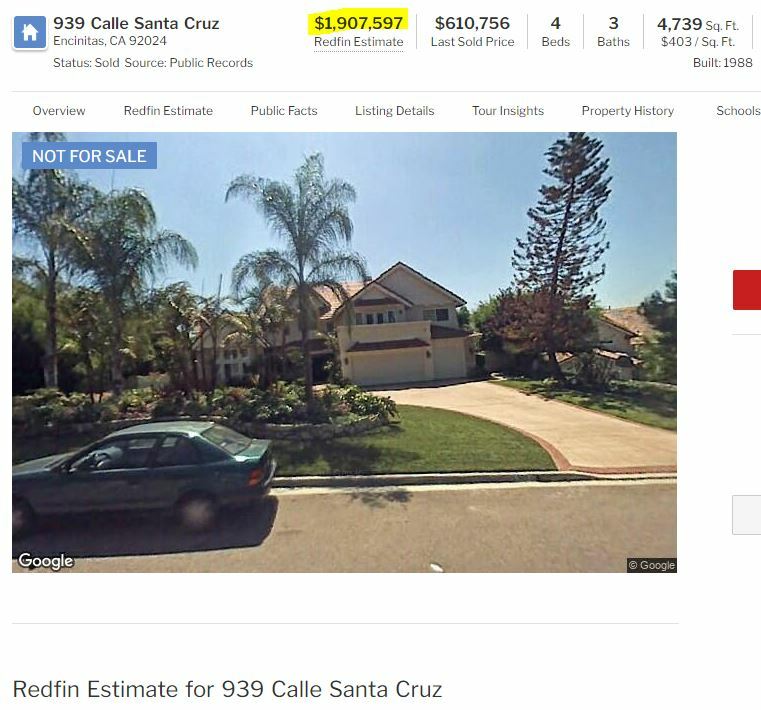 “A large number of these companies, Redfin included, are going to be selling direct to consumers,” he said. Will consumers trust them enough to buy and sell houses based on their fabricated estimates of value, without a realtor on their side? All that needs to happen is for these ibuyer companies to overwhelm the public with advertising, and convince you that their value estimates are close enough. The advertising is the key. Consumers don’t have much real estate experience and education, and it’s not easy finding helpful resources (how many real estate blogs are there?). They just want to click and go! It will be like TrueCar, where they advertise that their valuation system gives you an advantage, and to go down to one of their dealers to buy the car for that amount. TrueCar has sold over 2 million vehicles! Get Good Help….while you can! Barton also indicated there could be major changes coming to the way that Zillow deals with agents. 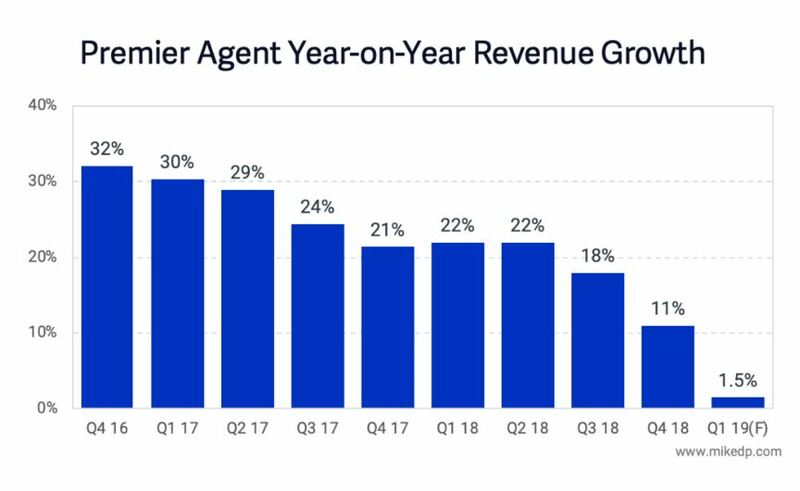 Thus far, Zillow has derived profits from charging agents to appear on the site, with the idea being that would-be homebuyers will find those agents and end up working with them. Barton told Stratechery that he wants to move away from a subscription based model and toward “a success-based compensation scheme that is around what happens when consumers actually close a transaction.” That will delay Zillow’s revenue but should whittle down the number or people the company is working with and improve the consumer experience. 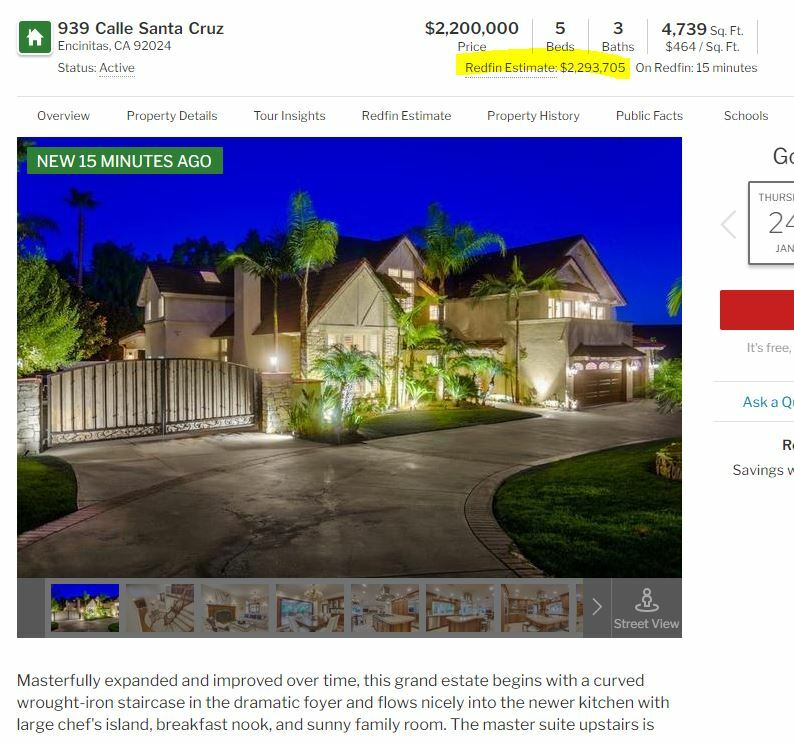 The comment appears to reference Zillow’s Premier Broker Flex Pricing program, which debuted last year. J.D. Ross, another cofounder at Opendoor, picked up on Barton’s comments and opined that Zillow appears to be acknowledging it will ultimately displace real estate agents. “So we see both of these lanes as critical because we want to serve everybody, we want to get everybody to a better place,” Barton said, referring to both Offers and the company’s agent-based business. Mike has been the leading resource on the ibuyer industry, and he sees it the same way I do – Zillow wants (and needs) to commit fully to their ibuyer program because advertising income from agents is starting to lag, which could be a major shift in the real-estate-selling business. He is having a seminar for those who might be interested. Zillow, the world’s largest real estate portal in terms of revenue, recently underwent a major shift in strategy. In effect, its advertising revenue stream has run out of runway; while still a billion-dollar business, growth has stopped. Thus, it is reorienting towards iBuying and its Zillow Offers program. In the world of grand strategy, the move is a rare, bet-the-company moment focused on one thing: the battle for the start of the consumer journey. Designed as a maneuver to simultaneously disarm competitors and strengthen its already powerful position, it’s either a masterstroke or a mistake. But in either case, Zillow is clearly “all in” on the gold rush that is iBuying. Zillow has set lofty goals: buying 60,000 houses per year and $20 billion in revenue. The stock price is up and the company is valued $2 billion higher than it was pre-announcement. This is big. This Friday I’ll run through all of the major points from this move, complete with charts, data, and insights. I’ll look at the numbers that matter, the metrics to keep an eye on, and what it all means for the larger ecosystem. I’ll also answer your questions! Read more details and register. Zillow’s competitors and potential competitors (portals and iBuyers). Real estate incumbents looking to formulate their iBuyer strategy. International real estate portals looking to learn from Zillow’s move. Investors interested in iBuying and what the market impact will be. Start-ups with a desire to understand the new landscape, and how they fit in. When the announcement was first made two weeks ago, Zillow stock went from 34 to 44, but it is back down to 38 today (LINK). Buying 60,000 houses a year isn’t the game-changer by itself. What matters is what their nationwide advertising does to the seller’s psyche – and will agents keep spending big money to get connected to the sellers who want more $$ than Zillow is willing to pay. On average, a customer asks Zillow for an offer on their home every five minutes, said Barton, signaling there’s ample consumer demand for a simplified home-selling process. “It’s like advertising free beer at a college party,” he said. In August, the company said that it was taking longer than anticipated to sell the homes it acquires. Three months later, it reported that some advertising customers were pulling their business because they disliked changes to the platform. Shares in the company, which peaked at $65.21 in June, plummeted to a low of $27 in November. Agents may have told Zillow that they were pulling their business because of changes in the platform, but that won’t be the end of it. 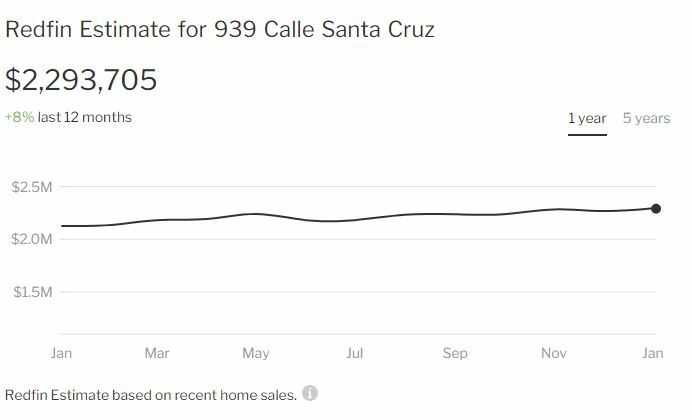 As the number of home sales decline nationally, realtors will slow or stop spending money – starting with the very expensive Zillow ads. Zillow still says they love realtors, but we’ll see about that. Once their advertising income declines, and the homes they bought start piling up, it is inevitable that they will think they don’t need agents any more. The next few years are going to be exciting! 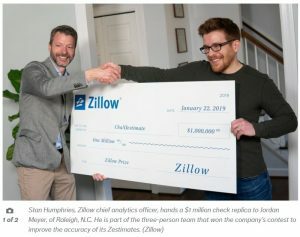 Hat tip to SM for sending in this detailed article about Zillow’s contest to improve the zestimate. No surprise that the winner was a group of analyzers who blended the algorithms to move the needle a couple of ticks. If they would have asked me, I’d say score each agent, and factor in +/- 5% based on who is selling the house – your agent makes that much of a difference! Everyone is getting into the home-buying business. 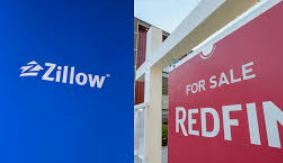 First it was the well-funded disrupters like OpenDoor and Offerpad, and then Zillow, Redfin, Knock and others jumped in – which caused Coldwell Banker, Keller Williams to also announce their programs (plus Compass and others won’t be far behind). What will the real estate world be like if sellers have multiple choices of cash buyers? Which ibuyer will have the advantage? Zillow is already in the driver’s seat, and they include the additional service of offering a third-party realtor’s opinion too. 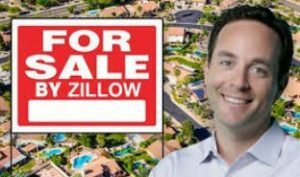 Zillow announced its Zillow Offers program in Phoenix earlier this year, and started buying houses in May. It is heavily promoting the program across its site. While looking in the Phoenix market, a prominent message is displayed on all active for sale listings. 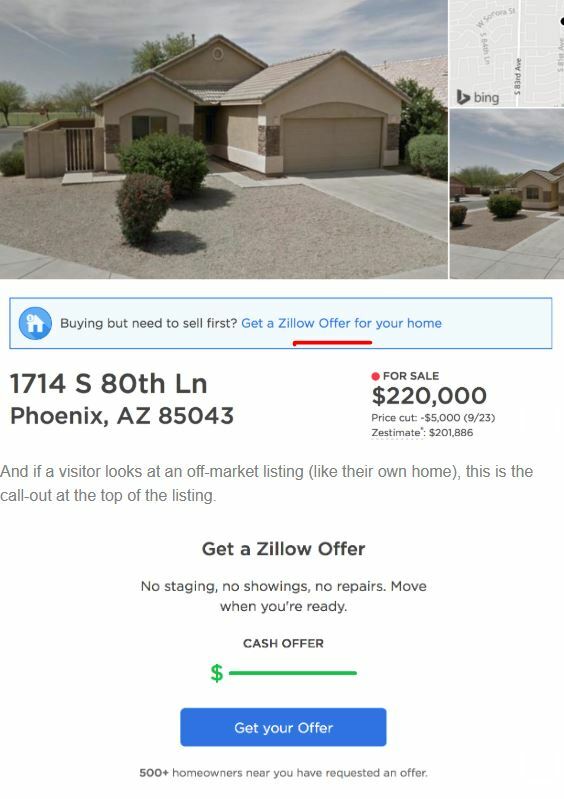 In its latest quarterly results, Zillow revealed how effective the promotion was: “Since launch, we have received more than 10,000 offer requests from potential sellers.” And: “…in Phoenix, for example, we are seeing about 15% of all dollar value that’s being sold in Phoenix any given month.” That translates to about 1,600 offer requests per month. Opendoor is on record saying that more than “one in two sellers who received an Opendoor offer” will accept it. It’s currently buying around 300 houses per month in Phoenix, so that’s about 600 offers made per month. There’s a difference between an offer being requested, and an offer being made. What’s clear, though, is that Zillow is generating a massive amount of offer requests each month, at volumes that rival (and exceed) Opendoor. Most importantly, Zillow’s leads are coming with zero incremental customer acquisition cost, while Opendoor and other iBuyers must advertise directly to consumers to generate leads. After using Zillow for years, consumers probably start to cozy up to the zestimates, just out of familiarity and convenience. Those who are new to the game – and believe Zillow to be an authority – are going to think the zestimate is a neutral opinion of actual value. But the zestimate is simply based on the list price, and not some fancy algorithm. Ryan at the sacramentoappraisalblog.com ran a post that showed how a zestimate fluctuated during the time the house was on the market. The zestimate nearly matched the list price, then went down with the first price reduction. Then once it sold, it really went nuts. That Zillow venture, then called “Instant Offers,” was announced in April, to mixed analyst reviews. “We are big fans of this pivot,” said Stephens’ John Campbell at the time. A few weeks later, RBC Capital downgraded the stock, saying the shift into what is now called Zillow Offers set the company up for a “transition year” even as the stock remained overvalued. 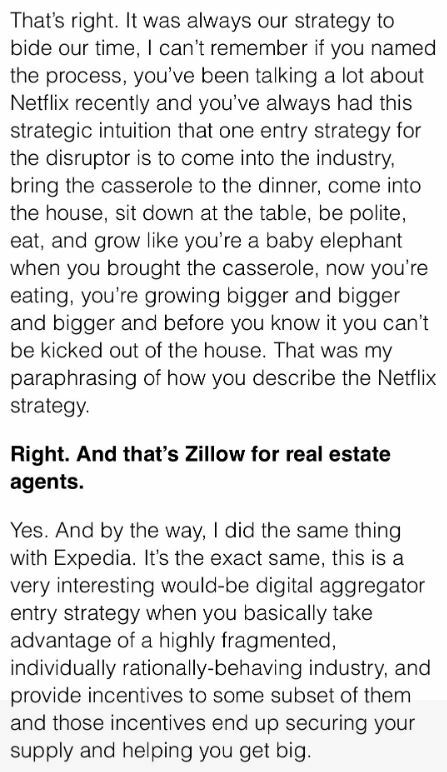 In response to a request for comment on Eisman’s remarks, a Zillow spokeswoman emailed, “we think Zillow Offers is an attractive service for sellers in all types of housing markets. 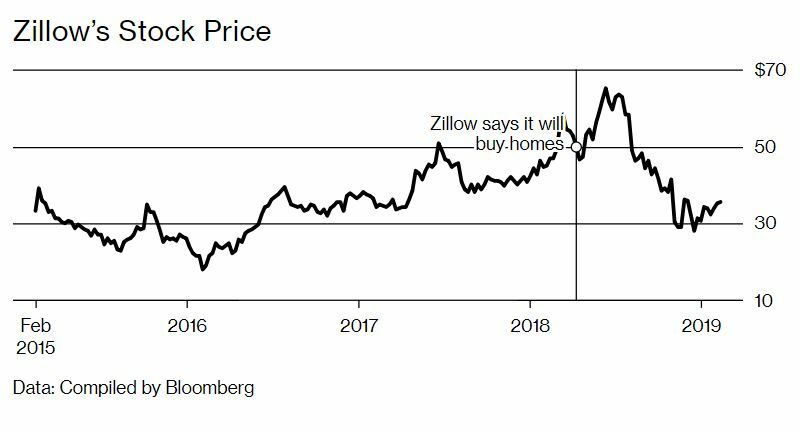 In a slower market, our offer might seem even more attractive to a seller.” Zillow shares, which had been up more than 50% for the year to date, tumbled nearly 7% after Eisman’s appearance. If Steve wants another reason, he should consider how realtors react to change in the market. 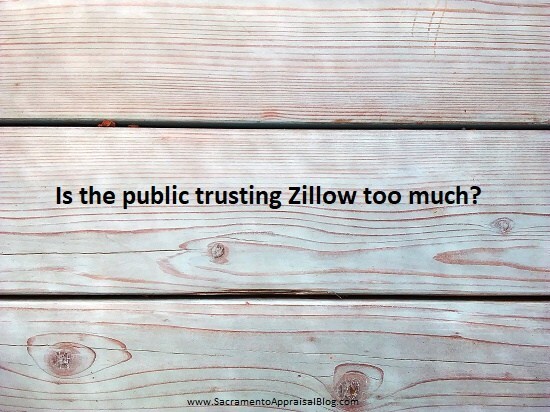 Yesterday, I saw an agent in a private realtor Facebook group ask for alternatives to the Zillow advertising he has been doing, which is exceedingly expensive. Historically, the minute the market turns, realtors stop spending money, and I think that time is here. This might be the greatest sucker play in the history of housing. 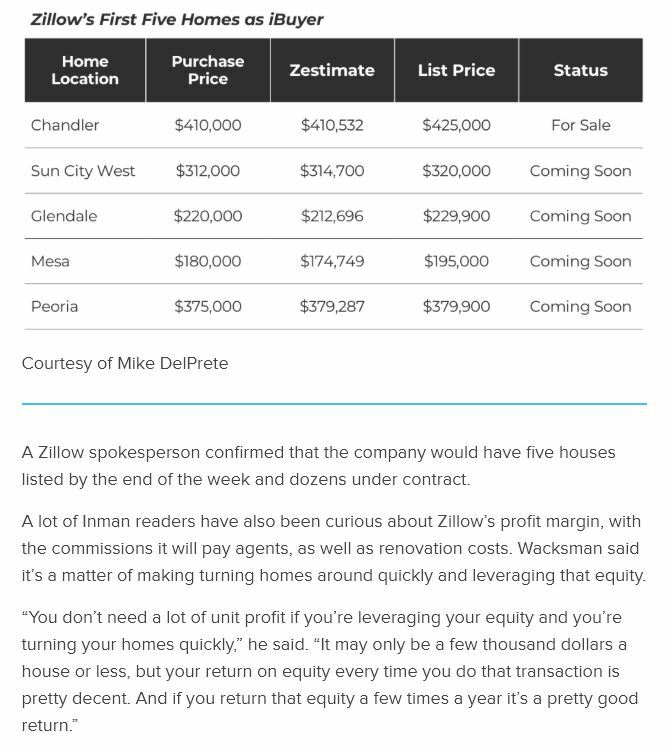 The I-news featured a story about the first five Zillow buys in Phoenix, and as you can see above, they are planning to lose money on all of them. The reporter also interviewed one of the homeowners who sold. She said that her offer from Zillow was higher than the other ibuyers (Opendoor and Offerpad). What a great way to enter an already-competitive market. Make headlines about offering the most money, and don’t look like you’re gouging the homeowners – heck, they look like Robin Hood! The publicity should fuel a surge of interest in homeowners wanting to sell to Zillow, and the story mentions that they are expanding their staff to 50 people in Phoenix to handle the ‘stronger-than-expected’ demand. It could just be a ploy to load up their Premier Agents with listings, and/or to gain advantage over the other ibuyers. 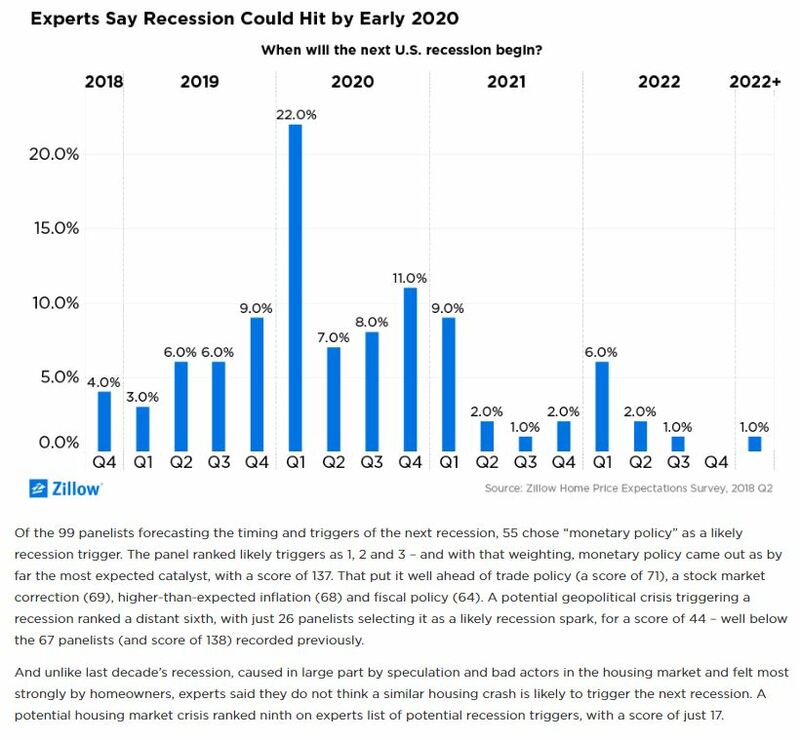 Experts in housing are predicting a recession starting in 2020, according to Zillow’s 2018 Q2 Home Price Expectations Survey; however, they anticipate monetary policy—not the housing market—as primarily responsible for the swing. Panelists were also asked to project the pace of growth in the Zillow Home Value Index over the next five years. The average of all expectations among the 114 experts offering a prediction was for home values to end 2018 up 5.5 percent over the end of 2017, a slowdown from current annual growth of 8 percent. On average, panelists said they expected home value growth to slow further in coming years – to 4.1 percent by the end of next year, 2.9 percent in 2020, 2.6 percent in 2021 and 2.8 percent by 2022.